The Mantal bar at Hotel Zeppelin. All photos courtesy of Viceroy Hotel and Resorts. From the outside, Hotel Zeppelin’s unassuming tan and black exterior gives little indication of what exists behind the hotel’s front doors. 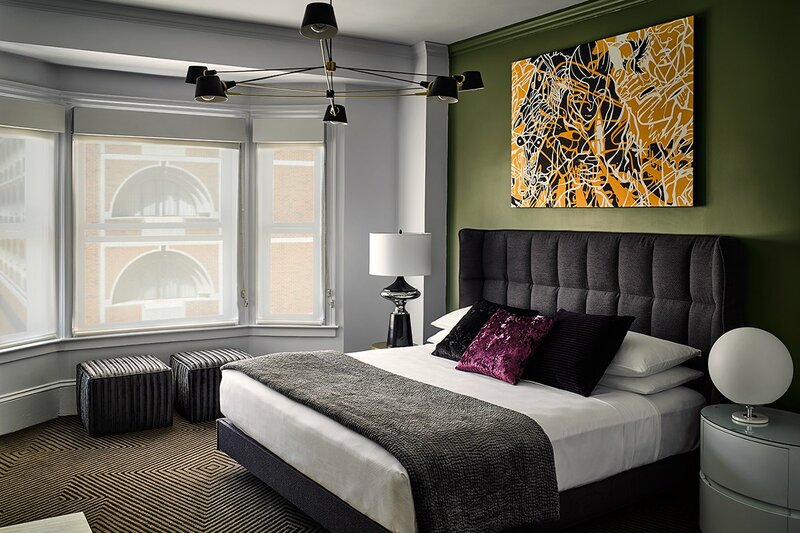 Taking cues from San Francisco’s counterculture traditions and progressive mindset, the 196-room boutique hotel has an edgy rock ‘n’ roll style with mid-century modern furnishings in dark and subdued colors, bold and bright design accents, and contemporary art. 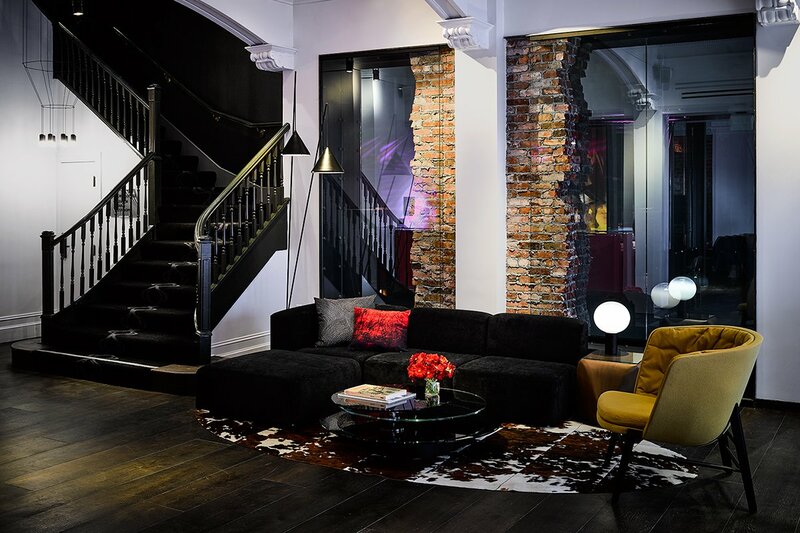 Located steps from the city’s iconic Union Square, the well-positioned location, psychedelic vibe, and intimate black-lit lobby bar make for a wild home base in the City by the Bay. 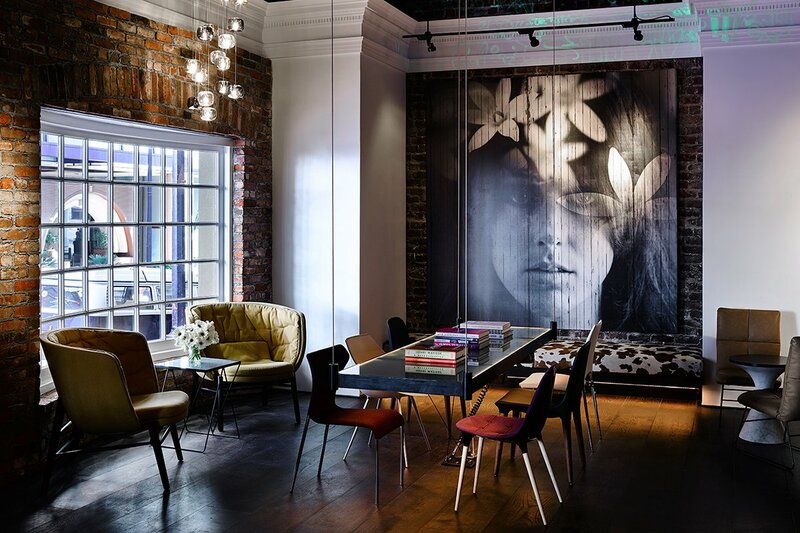 A hip respite in the city center with stylish furniture and art, interactive public spaces, and a gem of a lobby bar. A 1,334-square-foot game and meeting room with a full-sized bingo board, foosball table, quick-shot basketball wall, modular furniture, and floor-to-ceiling windows. It's an ideal space for letting your mind wander or for hosting your next company offsite. Nomadic millennials, progressive thinkers, and the young at heart. The central location and hip furnishings will appeal to tech, fashion, and media types alike. 196 guest rooms, ranging from 200-1,800 square feet, along with five luxury suites. From black leather headboards and modern lamps and seating, to John Boos maple top work desks and nightstands equipped with traditional and USB power hubs, the custom-designed rooms retain a distinct rock ‘n’ roll vibe fit for the rule-breaking artists, writers, poets, and musicians that inspired the hotel’s aesthetic. 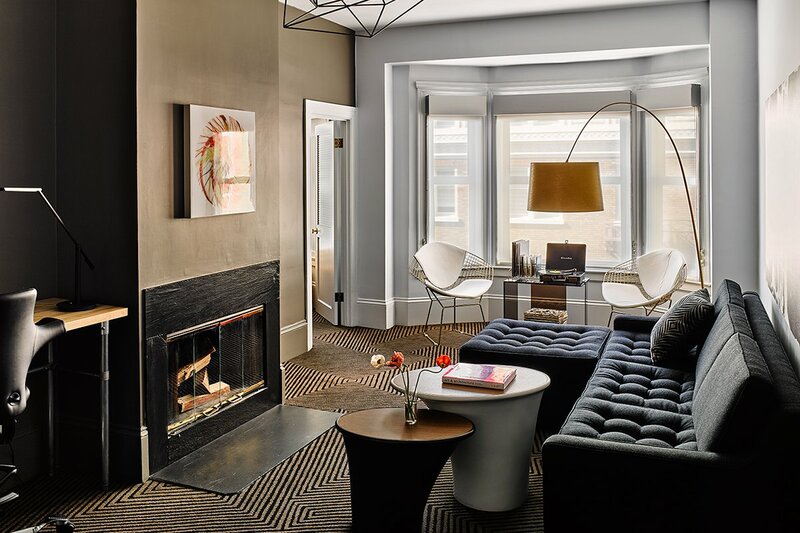 With plenty of room for an entourage, the Zeppelin Suite stretches across the top floor and includes a media room, wet bar, and outdoor deck; the Deluxe Suite includes a fireplace perfect for those chilly San Francisco evenings. A vinyl library (record players are available upon request), fitness center, meeting space, complimentary WiFi, and access to a fleet of Martone bicycles and EcoReco electric scooters. Rambler offers flavor-forward American fare with an Italian spin using locally sourced, high-quality meats and produce. Guests can dine in the modern brasserie with its eighteen-foot bar, tables, and leather banquettes. The dining room has a more private, clubby feel with soft gray flannel seating and a curated collection of vintage photography and lithographs. For inventive cocktails in an intimate space with a cozy fireplace and lounge seating, there’s The Mantel Bar in the lobby. Rates change seasonally and start at $200/night. Click here for reservations, or get in touch with the Fathom Travel Concierge, and we can plan your trip for you. With central San Francisco as its backdrop, Hotel Zeppelin has some of the city’s best drinking spots at its doorstep. Tradition, a revival cocktail bar, features a menu that pays homage to every era of alcohol. Bourbon & Branch has a main bar and five more not-so-hidden drinking dens inside. We’re fans of the refreshing no-cellphones house rule. For a mini-detox with drinks, there’s Onsen, a petite communal bathhouse-meets-bar and restaurant.